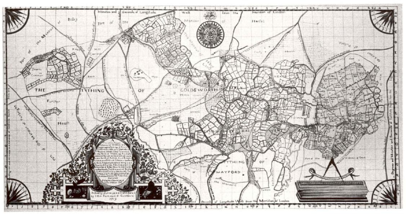 This is an image of a copy of the John Remnant Map of 1719 made by Joy Peckham, now Mrs Verinder then a member of the 6th Form at Woking Girls’ Grammar School in connection with her Advanced Level Stuart History studies. The copy is now in the care of Woking College, the original on which is based is at the Surrey History Centre. Copies of the original which is in colour can be obtained from the Centre. A Plan of the Royal manour of WOKEING containing the Tythings of Kinvil, Goldfworth, Hale end, Shakleford, Mayford Heath fide & Townend in the Parifh of Wokeing And alfo certaine Parcels or feveralls of Land in the Parifh of Pirford. And Broad Meads and Bollock Mead in the Parifh of Send. Situate Lyeing and being in the County of Surrey. Abbuting on the Manours of Bifley Haw land & Horfel on the North, The Manours of Bridley, Sutton and Send on the South. The Manour of Purbright on the Eaft. And the Manour of Pirford on the Weft. Being the’ Demaines of John Walter Esq Actually Surveyed & Delineated by John Remnant of Guldeford 1719. Thus reads the cartouche to the Map which covers the Royal Manor of Woking omitting the parishes of Byfleet, Horsell and Purford. Each piece of land is identified in the commentary together with its occupant. A small booklet, A Survey of the Mannovr of Wokeing MDCCXIX, reproduces all the information contained in the Commentary together with other additional details and is available from Phillip Arnold, Oakholme, Kingfield Road, Woking, Surrey GU22 9AA price £3 post free in the United Kingdom.